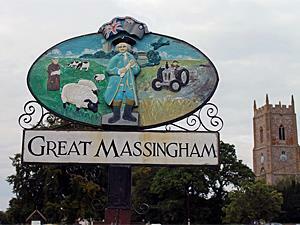 Great Massingham01553 763044work VillageSeveral large ponds dominate the village, some of which have their origins as the fish ponds for an 11th century Augustinian Abbey. The village is characterised by the flint and cobble cottages which huddle around these ponds. The village’s origins are thought to go back to the 5th century, but today it is still a thriving community with a village shop and post office, and pub The Dabbling Duck. The village church, St Mary’s has represented the focal point of village life for hundreds of years. For example the porch, added around 1300, was used as a school room. Sir Robert Walpole, England's first Prime Minister in 1720 is thought to have been educated in this porch as a young boy. His descendants still live in Houghton Hall 3 miles away. Several large ponds dominate the village, some of which have their origins as the fish ponds for an 11th century Augustinian Abbey. The village is characterised by the flint and cobble cottages which huddle around these ponds. Close to the Peddars Way, Great Massingham is well located in the heart of the west Norfolk countryside.